Opening Day 2012 – Mike and Roger! We both had a great time fishing with you last Monday, on the opening day of season. We both felt like we learned a ton, caught some beautiful fish, and really enjoyed the experience. Of all the guides on our trip, I definitely feel that we learned, and benefited the most from our time fishing with you. 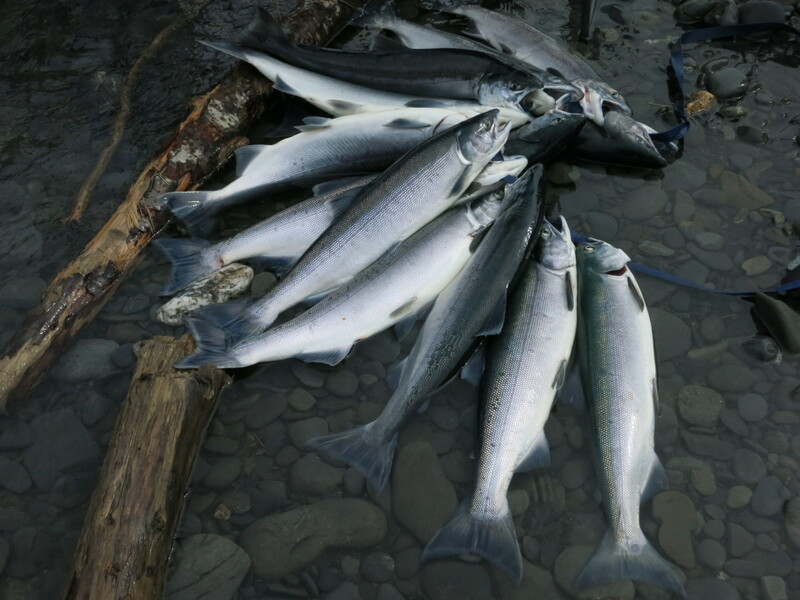 This entry was posted in River Report, Testimonials on April 13, 2013 by Kenai River Fly Fishing. Just wanted to pass along our “thanks” for our 2 trips with TJ and the one with Mike! We had a ball, and are already thinking about booking another trip for next year. You’ll remember Tony’s “SOB” outbursts! On July 25th my brother, son and I took a 1/2 day float trip down the Kenai river, our Guide was Mike Adams. I wanted to commend him on his professionalism and knowledge on the river. My brother and I have done several float trips around the US, and my brother has even fished the Amazon. My son is 15 and never has done a float trip and had no idea of what/when to do anything – Mike took the extra time and showed Wyatt exactly what to do and when. To say he was patient would be an understatement. Mike found us the fish. Wyatt hooked into a 23 inch Chum?? and landed it hopefully the picture came out, due to the weather we left our good cameras at home and I took this with my phone. Mike also told us about several places to have our catch processed and sent home; it should be here tomorrow, we cant wait… I can say if we are ever in the area again we will use your guide service again and will pass your info on to friends traveling. Again my complements to your service and especially Mike. 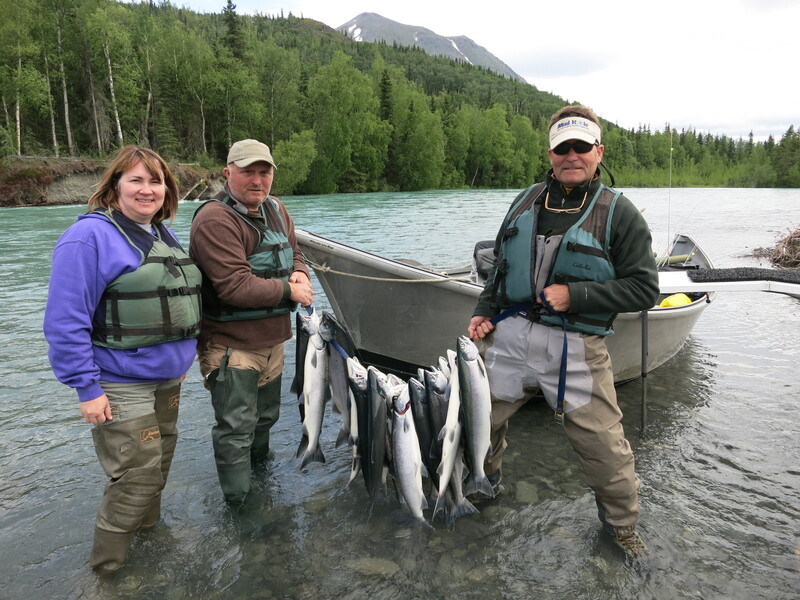 This entry was posted in Testimonials on July 25, 2010 by Kenai River Fly Fishing. Mark and Michael Kocan’s Trophys! I just wanted to write you and thank you again for the fishing experience of a life-time that you gave my son and me just a few weeks ago this July. 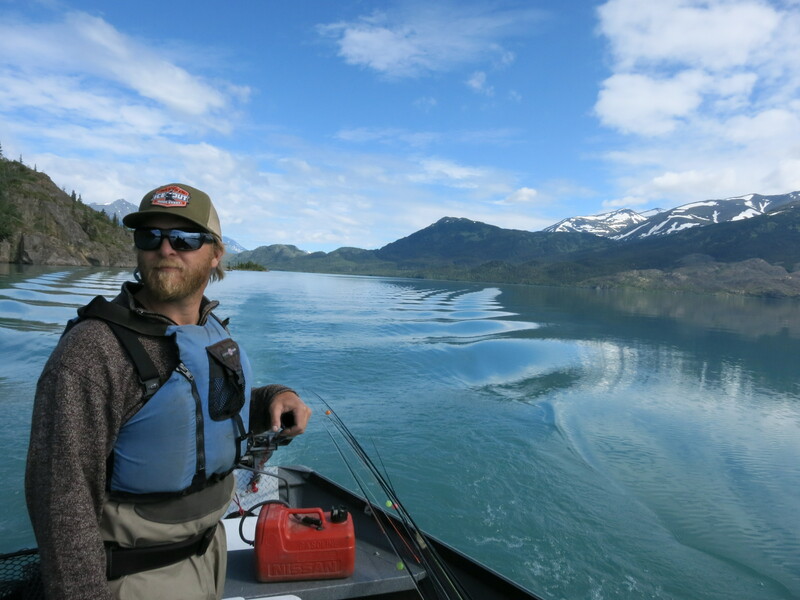 We took two trips with Brandon down the Kenai and it was just simply fantastic. I was looking at your pics and thought I’d offer a few to you for your consideration to put on your site. We’re so proud of them we just had to show you how they turned out. Again, thanks for the memories and with a little luck we will be back soon to do it all over again! We’re saving our pennies! 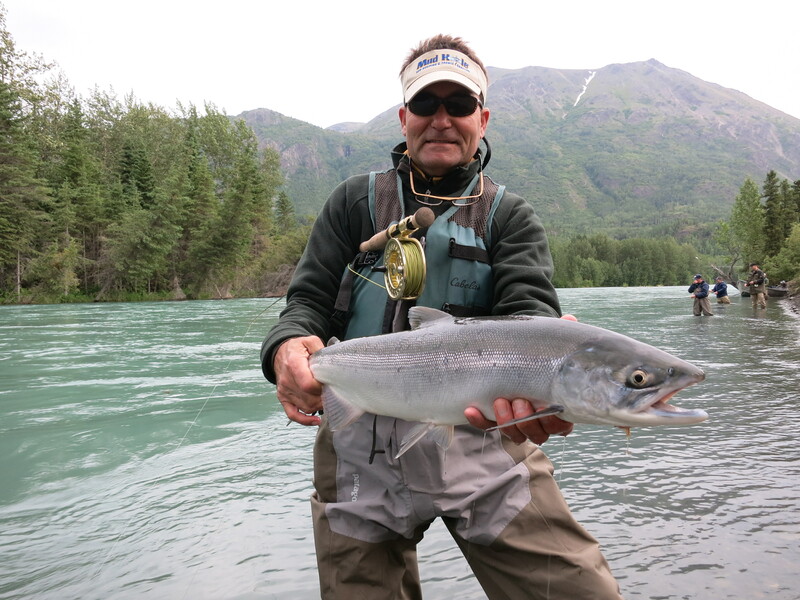 This entry was posted in Testimonials on July 14, 2010 by Kenai River Fly Fishing. I wanted to drop a line and tell you our two guided trips with Mike last week were awesome. He is a great fisherman and steward of your fabulous fishery and land. He put us on fish and was very helpful to Tricia and myself in both mentoring and rooting us on to make our experience a great one. Mike is a super representative of your company and your environment. We are already making plans for a return next year. I have been fortunate to fish in Mexico, Hawaii, Texas and Canada. But this experience was the best. Of all the fish I chase, I still love to trout fish and nothing hold a candle to those crazy Rainbows in Alaska. 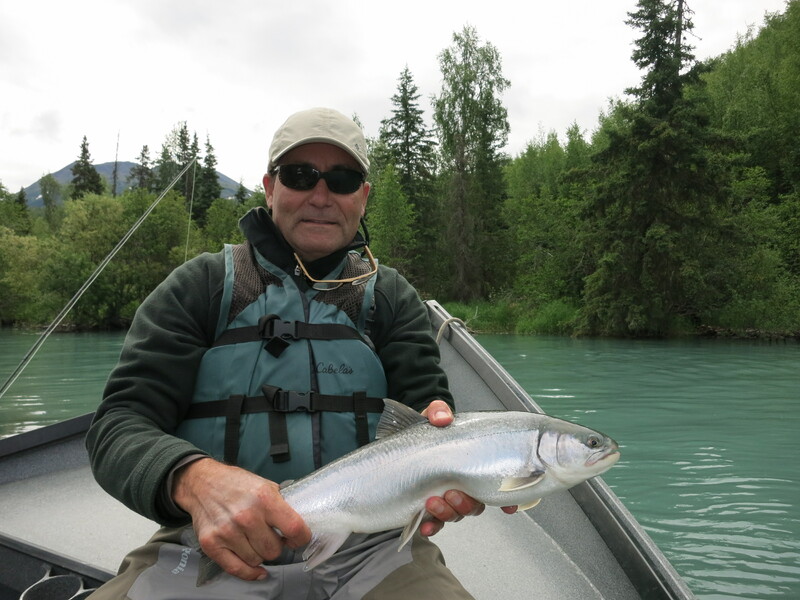 This entry was posted in Testimonials on June 20, 2010 by Kenai River Fly Fishing. Chris Heimerl gets a 30″ Bow! This is an email to congratulate you on a great guide you have in Ben. He took us out on the middle Kenai river. Ben set up my buddy Tim and I with a fly he recommended and on one of my first drifts I hooked up with a beautiful rainbow around 18 inches. Then two more fish on the following drift. It was a great start to the day to warm up in frigid weather. All this lead up to the trout of my life (thus far), a 30 inch beauty. Ask to see the picture he took, heck post it on the website! I’ll never forget it. Ben knew what he was doing. I’d recommend him any time. 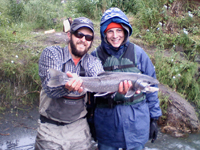 This entry was posted in Testimonials on August 14, 2009 by Kenai River Fly Fishing.